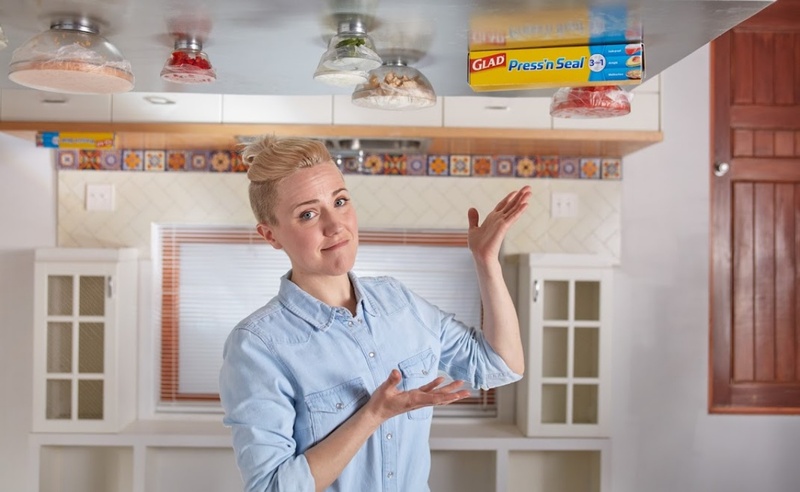 Hannah Hart, who is already on the National Board of Directors of GLAAD (the organization), is now associated with Glad (the household brand) too. In a recent branded video, the YouTube star was strapped into a harness and suspended upside down in order to promote Glad’s Press’n Seal cling film brand. The video, which Hart shared on her YouTube channel, is framed around a “cooking challenge” that features Glad products. While hanging upside down, Hart assembles a burrito using ingredients that are protected from the pull of gravity by a combination of Press’n Seal and a few powerful magnets. By the end of the five-minute video, Hart has dropped plenty of ingredients on the ground and has gone a little red in the face, but she manages to put together her burrito, which (spoiler alert) she promptly drops as well. Hart’s collaboration with Glad was produced by Portal A, the Bay Area-based studio known for its work within the online video community. Among other projects, Portal A is responsible for the yearly YouTube Rewind collaboration. Here, through some clever camera work, Portal A and Hart are able to produce a clip that looks like few others on YouTube. It is known: Videos shot in zero-g environments are cool.